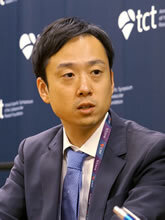 Hiroki Shiomi, MD, PhD, is Assistant Professor of Department of Cardiovascular Medicine, Kyoto University Graduate School of Medicine, Kyoto, Japan. He presented the ReACT Clinical Trial at the 2016 Transcatheter Cardiovascular Therapeutics meeting in Washington DC, and was interviewed there by TCROSS NEWS about the trial results. TCROSS NEWS, a Japanese education and news site for interventional cardiology in Japan, will be partnering with Angioplasty.Org on this and future topics of mutual interest. The ReACT Trial evaluated the effectiveness of routine angiographic follow-up after coronary artery stent implantation in the Japanese population. Routine angiographic follow-up is a common practice in some Asian countries especially in Japan. The results indicated that routine follow-up coronary angiography after PCI, as compared with clinical follow-up alone, did not bring any significant clinical benefit. Q: Unlike the Japanese practice, routine follow-up angiography is not utilized widely in the U.S. Could you explain why it has been common in the Japanese interventional community? Dr. Shiomi: Well, as compared to the U.S. and many other European countries, PCI but not CABG plays significant roles in coronary artery disease in Japan. We routinely perform PCIs in complex lesions including left main artery disease, multivessel disease, and/or chronic total occlusion. We need to carefully follow a patient who underwent PCI in these complex lesions to prevent unfavorable events after the procedure. Yet, with the advent of drug-eluting stent era, we sometimes have such negative events like a very late stent thrombosis. Thus, routine follow-up angiography, covered by Japanese universal health insurance, is commonly performed in our practice. Indeed, it is true that we have learned a lot more from routine follow-up angiography. Causes of unfavorable events such as vascular healing process, possible mechanisms of late stent thrombosis and late catch-up are often clarified by routine follow-up angiography. At the time of routine follow-up angiography, we simultaneously use other imaging modalities including IVUS and OCT/OFDI. We strongly believe that implementing these practices helps us obtain new knowledge and insights which have contributed to the evolution of coronary intervention. On the other hand, there is a lack of evidence supporting routine follow-up angiography after PCIs in real world practice. Thus, the aim of the present study is to reveal the effectiveness of routine follow-up angiography. Q: In the present study, patients after coronary artery stent implantation were assigned to routine angiographic follow-up or to clinical follow-up. Wasn’t it difficult to enroll patients in the clinical follow-up group since routine follow-up angiography is common in the Japanese interventional practice? Dr. Shiomi: Yes, you are right indeed. When we initially started the present study, routine follow-up angiography post-PCI accounted for more than 80% of the entire practice in Japan. We explained to investigators how to perform clinical follow-up in half of the patients enrolled in the study. We persuaded patients offering treadmill test and/or scintigraphy to observe them closely during the study period. Perhaps, the present study is not acceptable in the U. S. where clinical follow-up is what is mainly performed. Q: In the ReACT Trial, patients who were randomized to routine follow-up angiography were more likely to receive revascularization. Was revascularization performed on the target lesion or a new lesion? Dr. Shiomi: Revascularization in the present study occurred in either a target lesion or a new lesion approximately 50/50. Decision to perform revascularization was based upon the operator’s discretion. Clinically-driven revascularization strategy was performed in approximately 70% of the patients. The result showed an increase in clinically-driven revascularization in Japan as opposed to our previous study known as the CREDO-Kyoto Registry. Q: Drug-eluting stents were used in more than 80% of the patients in the present study. Do you think that a type of drug-eluting stents (DES) or/and the DAPT duration influences the outcome? Dr. Shiomi: I do not think that the type of DES or/and DAPT duration affected the present study as long as the second generation DES was used. More than 90% of the patients received the second generation DES in our study. DAPT duration was not regulated within the protocol in our study; instead it was the operator’s discretion. I do not think that the duration of DAPT affects the outcome. I assume that a patient assigned to the routine follow-up angiography who received coronary angiography at one year and underwent re-PCI to treat restenosis resulted in starting a second DAPT therapy following the procedure. Therefore, the duration of DAPT in the first PCI may not affect such a patient’s outcome. However, it should be noted that the present study was underpowered. Q: What are clinical implications in the present study in your practice? Dr. Shiomi: Prior to the present study, routine follow-up angiography was commonly performed in our daily practice. However, the patients assigned to the clinical follow-up group were not likely to experience unfavorable events in comparison to the angiographic follow-up group. Considering the increase in medical expenditure in the aging Japanese society, we should seriously reconsider the need for invasive routine follow-up angiography to prevent less foreseeable events within the current practice. Upon the completion of the present study, routine follow-up angiography is only performed in patients within high risk category in our hospital. Q: What are take home messages in the present study? Dr. Shiomi: Unfortunately, the present study was underpowered in the sample size, failing to confirm the effect of routine follow-up angiography. However, Kaplan-Meier event curve in both groups overlapped in the long-term period. Therefore, routine follow-up angiography cannot be recommended as a clinical strategy even in Japanese practice despite the certain benefits previously discussed. Q: One of the panelists during the presentation in main arena asked you that “which access route was selected in routine follow-up angiography?” Do you have any comments on the question? Dr. Shiomi: It is very good question indeed. Radial artery is the main access route in more than 90% of the Japanese follow-up angiography, unlike that of the U.S. (mostly brachial and femoral artery). Thus, complications associated with follow-up angiography were less common in the present study. Perhaps, less complication rates in our practice encourages the use of routine follow-up angiography. It is noted that insurance system in Japan is different from the U.S. In Japan, universal health insurance covers most expenses including routine follow-up angiography. Therefore, Japanese interventional cardiologists prefer performing routine follow-up angiography for patients, particularly those who received complex coronary interventions. We historically favor the implementation of follow-up angiography believing to prevent future unfavorable events. However, the result of the present study may amend the Japanese practice in the near future.